Posted on May 9, 2017 May 8, 2017 , in Hot Tubs. Deciding whether to invest in an indoor or outdoor hot tub can be tough. There are many considerations to make before making your final choice. Below you’ll find out about the key areas you’ll need to think about before you buy. Your top consideration before you choose an indoor or an outdoor hot tub is what you will use it for. First, think about whether or not you want to use your hot tub every day. If you’re someone who suffers from chronic stress or pain, it may be important to you to use it on a daily basis. Even if you don’t use your hot tub for serious therapeutic purposes, you may just enjoy using it every day. For everyday use, the best choice is an indoor hot tub because you won’t have to disrupt your schedule due to unpredictable weather. If, on the other hand, you feel more flexible about when you’ll use your hot tub, an outdoor installation may suit you. Outdoor installations are especially satisfying to people who find it exhilarating to soak during the extreme temperatures of winter. Whether you install your hot tub indoors or outdoors, construction will be a factor, but it’s important to know upfront that indoor installation is typically more disruptive than outdoor installation. With an outdoor hot tub, you can simply dig a hole in your yard if you decide to install it in the ground. You’ll also need to install a power source for electricity. Neither of these will require you to make major alterations to your outdoor space. Indoor installations can cause a few more issues. For one, the noise and inconvenience may not be something you want in your home. After installation, you’ll also have to take special measures to prevent the heat and humidity from damaging your ceilings, furniture, and flooring. That means you’ll need to install proper ventilation like fans and windows. Indoor hot tubs sometimes require structural support. If you decide to go with an indoor hot tub, keep in mind that it will likely come with a substantially higher price tag. 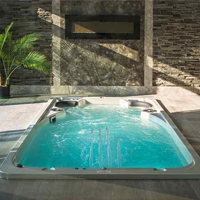 When you want to spend your time using your hot tub rather than maintaining it, an indoor installation offers the minimum level of maintenance. Because it is enclosed, you won’t have to deal with debris, rainfall, and other outdoor issues that can clog your filter and disrupt your water balance. If you do decide to install outdoors, purchasing a good quality cover will go a long way toward making maintenance easier. It will also lock heat in which will lower your energy use and bills. Now that you’ve found out more about what to consider before you decide on an indoor or outdoor installation, download our buyer’s guide and look at our wide variety of indoor and outdoor options.